Product prices and availability are accurate as of 2019-04-23 19:24:08 GMT and are subject to change. Any price and availability information displayed on http://www.amazon.com/ at the time of purchase will apply to the purchase of this product. 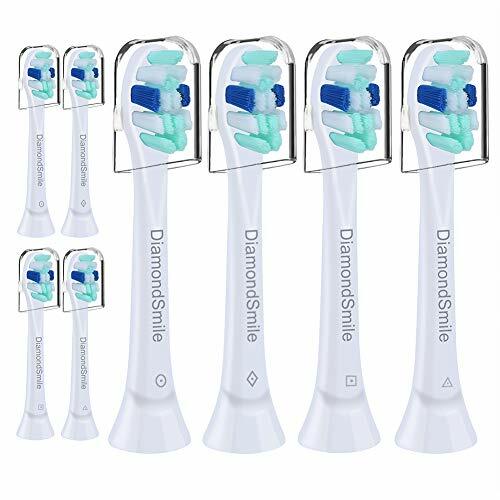 DiamondSmile is committed to provide high-quality generic Sonicare toothbrush replacement heads for Philips.Designed to work with multiple Sonicare models,these snap-on replacement brush heads. Reminder bristles fade to let you know when it's time for replacement. We recommend you replace these heads every 3 months for optimal performance and plaque removal. ?Packaging Item: 8 standard advanced plaque removal brush heads + 8 hygienic travel caps. 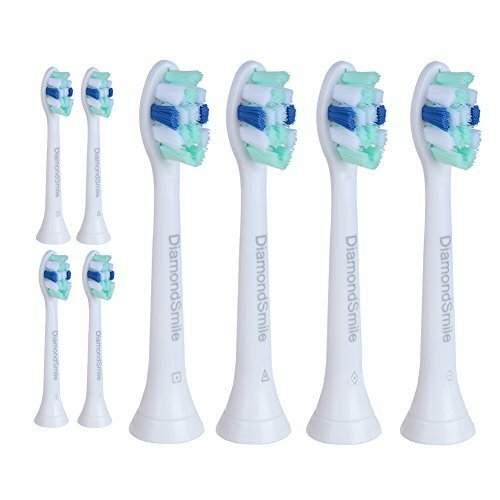 Disclaimer: These replacement toothbrush heads are manufactured independently by DiamondSmile-US. Fits Philips Sonicare snap-on brush handles. Snap-On Toothbrush System - Fits for Philips Sonicare 2 Series Plaque Control,3 Series Gum Health,DiamondClean,EasyClean,Essence+,FlexCare,FlexCare+,FlexCare Platinum,HealthyWhite,HealthyWhite+,Power Up,Sonicare for Kids and HydroClean brush handles. 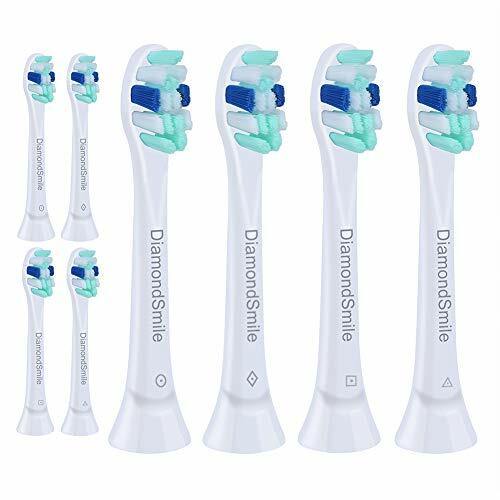 Advanced Plaque Removal - DiamondSmile replacement brush heads made with end-rounded US Dupont Tynex Nylon bristles,bristles has medium hardness and soft.This toothbrush head features densely-packed,high-quality tufts to effectively remove plaque. Also features specially curved power tufts to easily reach teeth at the back of the mouth. Replacement Reminder - Blue reminder bristles will fade to white when a replacement toothbrush head is needed.For optimal results, replace your brush head every 3 months. 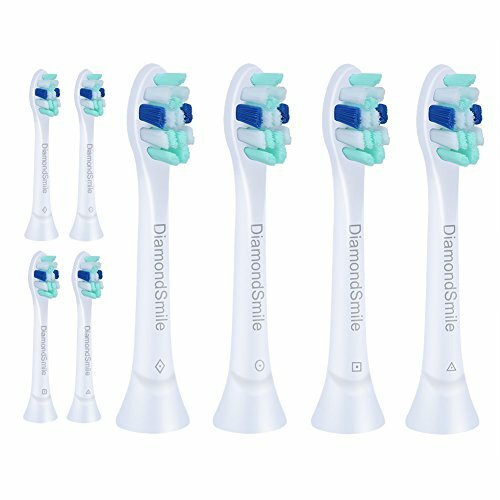 Hygienic Travel Cap - DiamondSmile replacement Sonicare toothbrush heads come with caps for hygienic storage,effectively protect your toothbrush head is not outside pollution.Each brush base has a different mark as a distinction,so you can easily tell every brush apart. Satisfaction guarantee - We Provide 100% Satisfaction Guaranteed or Your Money Back Service,If you have any issue just contact us.